Home > Seattle University > Seattle Univ. Chieftains beat the Harlem Globetrotters! 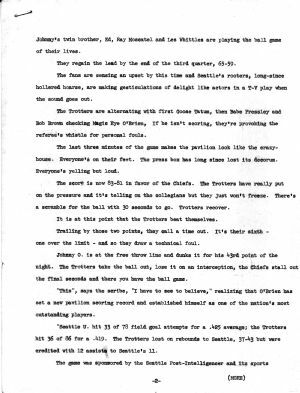 I title this page, The Rest of the story, because at least for now, it's missing page 1 of Jack Gordon's three-page recap of Seattle U's marvelous victory over the "clown princes of basketball," the Harlem Globetrotters. When he wrote this press-release story, Jack was the Athletic Publicity Director for the University, having served in that or similar positions since 1947. Johnny's twin brother, Ed, Ray Moscatel and Les Whittles are playing the ball game of their lives. They regained the lead by the end of the third quarter, 65-59. The fans are sensing an upset by this time and Seattle's rooters, long-since hollered hoarse, are making gesticulations of delight like actors in a T-V play when the sound goes out. The Trotters are alternating with first Goose Batum, then Babe Pressley and Bob Brom checking Magic Eye O'Brien. If he isn't scoring, they're provoking the referee's whistle for personal fouls. The last three minutes of the game the pavilion look like the crazy-house. Everyone's on their feet. The press box has long since lost its decorum. Everyone's yelling but loud. The score is now 83-81 in favor of the Chiefs. The Trotters have really put on the pressure and it's telling on the collegians but they just won't freeze. There's a scramble for the ball, with 30 seconds to go. Trotters recover. It is at this point that the Trotters beat themselves. Trailing by those two points, they call a time out. It's their sixth -- one over the limit -- and so they draw a technical foul. Johnny O is at the free throw line and dunks it for his 43rd point of the night, The Trotters take the ball out, lose it on an interception, the Chiefs stall out the final seconds and there you have the ball game. "This", says the scribe, "I have to see to believe," realizing that O'Brien has set a new pavilion scoring record and established himself as one of the nation's most outstanding players. Seattle U. hit 33 of 78 field goal attempts for a .425 average; the Trotters hit 36 of 86 for a .419. The Trotters lost on rebounds to Seattle, 37-43 but were credited with 12 assists to Seattle's 11. The game was sponsored by the Seattle Post-Intelligencer and its sports editor, Royal Brougham, at the request of Howard Hobson, finance chairman of the U.S. Olympic games committee. The game poured almost $10,000 into the fund and gave Seattle sports fans a talking piece for years to eome. The top-asking price was $1.50 a seat. The clown-princes of basketball didn't have a chance to clown but nobody seemed to care. It was a great victory for a great cause and a sensational testimonial for O'Brien, the diminutive "David" who substituted a hook shot for a slingshot to down basketball's world-travelling "Goliaths".